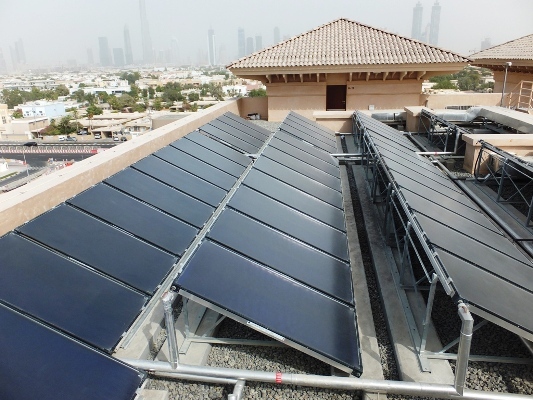 Dubai’s solar thermal obligation has had a positive impact on demand for solar water heating systems across the emirate. Since March 2012, newbuilds with a single owner, such as hotels, workers’ dwellings, private villas, shopping malls and public buildings, have had to cover at least 75 % of their annual hot water requirements by solar energy, provided that enough roof space is available. Proprietors of swimming pools have had to install additional solar thermal systems with a capacity of 50 % or more of the total required for heating these pools (see the attached Dubai Municipality Circular No. 183 from 2011). “Consultancies, building owners and construction companies have since become increasingly aware of the opportunities of solar water heaters,” explained Jim Sebastian Parambil, Managing Director of Ecoval Trading, Dubai, UAE. His company, which specialises in heating and cooling solutions with solar thermal collectors and heat pumps, has been in the business for more than 14 years. The photo shows one of Ecoval’s 2014 systems, which consists of 200 Solahart BT collectors and was installed at the Four Seasons Resort Dubai at Jumeirah Beach. Parambil confirmed that Dubai has strictly enforced the solar obligation: “You absolutely do not receive a building permit unless the owner presents the design documents on the planned solar water heating system to the authorities.” At high-rise buildings with limited roof space, the size of the collector field is based on the space available, and smaller solar shares will be accepted by Dubai’s municipality authority. Solar is optional for buildings with multiple owners or tenants. However, most newbuilds in many areas of Dubai had received a 20 to 30 % lower capacity from the Dubai Electricity & Water Authority (DEWA), according to Parambil, which was forcing most building designers to look for alternative sources of energy. Circular No. 183 of 2011 stipulates that the economic life of the solar heater system must be 15 years or higher, with a warranty covering at least the first five years. Suppliers need to have a license by the Department of Economic Development and must be included in the List of Registered Suppliers of Certified Solar Water Heating Systems (see the attached Excel file with March 2016 data). Creating roof space: A steel structure provides the support for 750 m2 of collectors on the 33-storey Al Shafar building in Abu Dhabi, although there had already been equipment on the roof. Increasing energy prices over the past years have also prompted a number of hotels in Dubai and the other emirates to upgrade their hot water systems to incorporate more energy-efficient technology, such as solar water heaters or heat pumps, or a combination of both. 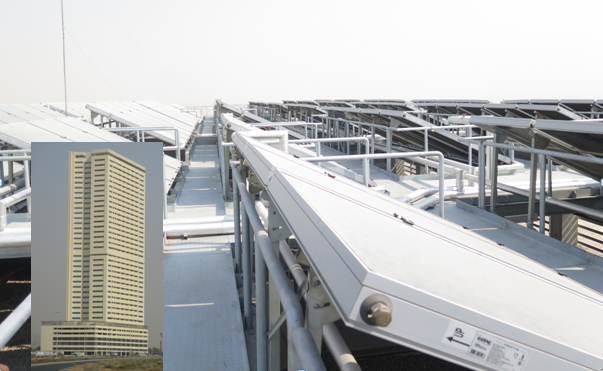 Although Ecoval has installed its largest single-user solar hot water system at TDIC, Abu Dhabi (3300 Solahart collectors delivering 750 m³ per day; see photo), the company’s most prestigious project of 200 Solahart BT collectors (see the photo above) was set up at the Four Seasons Resort Dubai in 2014. ”We used a drainback system with two 7,000-litre thermal tanks to avoid wet stagnation in summer,” Parambil explained his company´s unique selling point. “During the hottest time of the year, people tend to shower less with warm water, which means that the thermal tank often attains its final temperature while irradiation continues to be available.” In this case, the solar pump stops and the primary fluid flows down into the drainback heat storage tank. Empty collectors can withstand the high irradiation and temperatures much better than ones under pressure by a boiling fluid. Ecoval focuses mostly on solar thermal solutions because of quicker payback periods. Parambil said that the high outdoor temperatures reduced the efficiency of PV modules and the accumulating dust made it necessary to clean them regularly. A lack of transparent feed-in tariffs or no tariffs at all pushed the payback of solar electricity installations to 10-15 years, which made them unattractive. Dubai is the front runner for green buildings among the United Arab Emirates. In 2010, the emirate had already implemented Green Building Regulations for government structures. They became mandatory for all new buildings in 2014 (see the attached document). The rules jointly developed by DEWA and the Dubai Municipality aim at improving building performance by reducing the consumption of energy, water and materials and increasing public health and safety. DEWA signed comprehensive Energy Savings Performance Contracts (ESPC) for seven of its own buildings in 2015. It had 55 energy conservation measures implemented, saving 5 GWh of electricity per day. According to the flyer DEWA Buildings Retrofit, the government agency had the old and inefficient air-cooled chiller plant at its main office replaced with a new highly efficient water-cooled system, the split units removed, variable-frequency drives (VFDs) installed at motors and pumps and variable fresh air supply systems integrated, including CO2 and occupancy sensors for the lights. Solar cooling was not considered as a retrofit option. Parambil explained: “The investment cost of solar cooling is often three to four times higher than for large-scale compression chiller units, and electricity prices are still low compared to Western countries. Besides, you need the space for the collector fields.” Ecoval supplied solar absorption cooling systems to some large projects in the past, but with the high initial capital cost, this option has been unattractive to most property owners.